Samsung Electronics Co. Ltd. in the Indian market announced to launch its Windows 8-based smart devices. It ATIV Smart PC and ATIV Smart PC Pro Series includes 5. Samsung's first touch featuring ultra book™ having a 15-inch display. 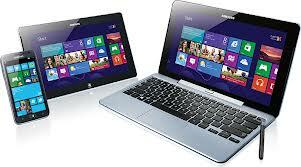 Samsung Series 9 Ultra book ™ and AMD-based Series 5 Ultra book also offered. Windows based these gadgets will be available for sale in the Indian market from today onward ATIV Smart PC and ATIV Smart PC Pro traditional notebook PC simply by pressing a button that can be converted into a tablet PC. ATIV Smart PC Pro has been priced at Rs 75,490, while ATIV Smart PC is available at a price of Rs 53,990.